3D printing or additive manufacturing is a process of making three dimensional solid objects from a digital file. 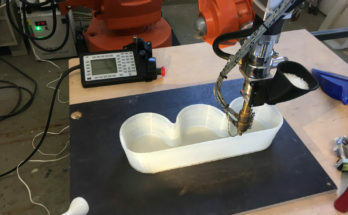 Industrial robot arms are typically used in applications such as pick and place, welding, trimming or machining, but that doesn’t mean robots can’t be used for 3D printing. This concept extends to industrial robots in construction for concrete 3D printing. 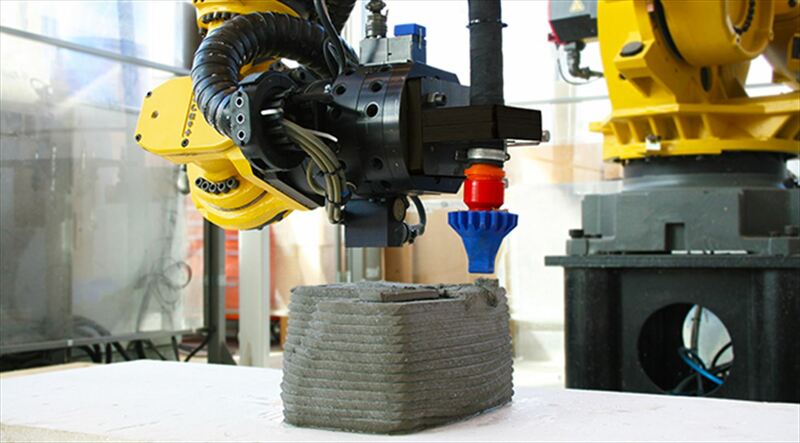 Robotic 3D printing systems have become popular, mostly in construction and architecture. The creation of a 3D printed object is achieved using additive processes. In an additive process, an object is created by laying down successive layers of material until the object is created. Each of these layers can be seen as a thinly sliced horizontal cross-section of the eventual object. As an example, the Danish Technological Institute uses RoboDK to program robots to build 3D Printed Buildings project. 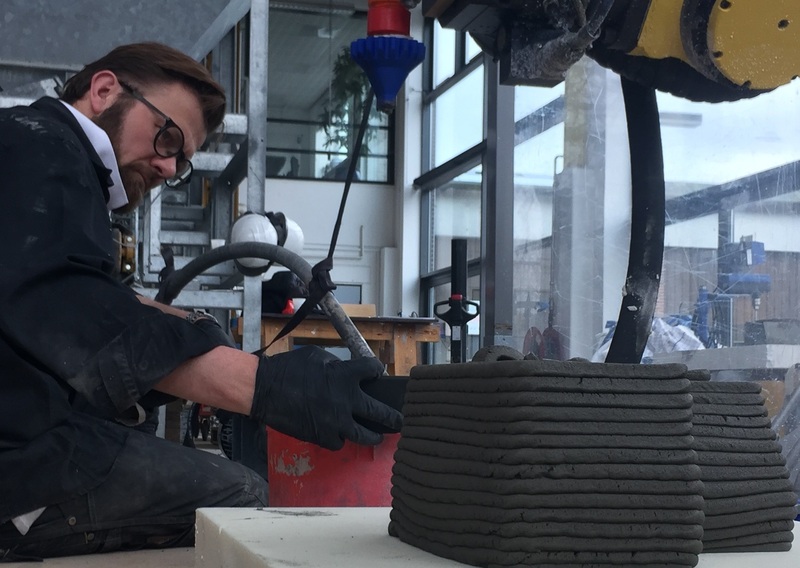 In a matter of days after getting started with RoboDK, Teknologisk Institut was building successful sample parts in concrete. The workflow CAD-CAM with RoboDK was very straightforward. Thanks to RoboDK we were able apply our 3D concrete printing skills and the developed concrete mix design to our Fanuc robot for concrete 3D printing in a very short time. 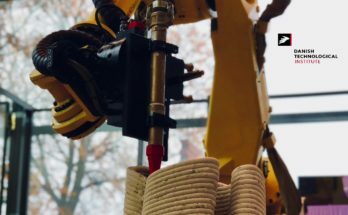 The Danish Technological Institute focuses on developing methods for robot-based 3D printing building elements, boosting innovation and productivity in construction. The project also focuses on unexplored architectural possibilities that 3D printing technology can deliver in construction. RoboDK simulation and offline programming tools can be easily used to convert machine code to robot programs. 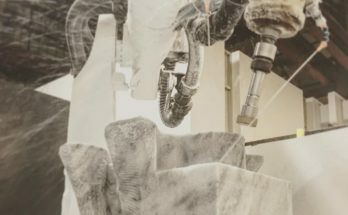 For manufacturing applications such as 3D printing or machining it is possible to integrate 3rd party software such as slicer software or CAM software with RoboDK and quickly accomplish successful results. We’re looking forward to seeing how the 3D Printed Buildings project impacts the future of Danish construction! Do you have an industrial robot? We invite you to try RoboDK software now. We make extruders also for large scale plastic 3D printing and want to test this with a Universal robot on a show in The Netherlands. 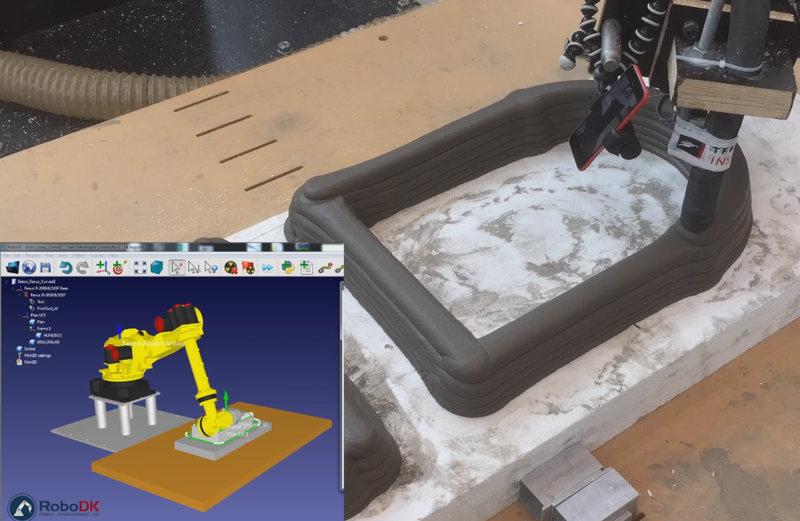 We can rent a robot and think we need this software to make it useful for 3D printing. Can we use a test version for 1-2 weeks for the show. 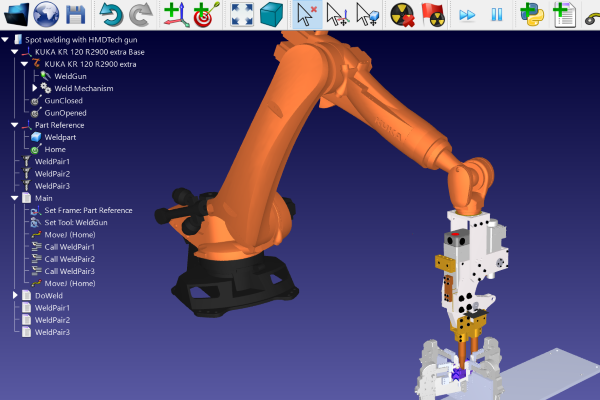 When we sell a compleet system, Robot-arm, extruder we also need this software. what can you offer ius. The trial version should be enough for you to test it. Could you please inform the price for the 3d printing module of the RoboDK? We have ABB industrial robots IRB 4600 and would like to learn about 3D printing. The price of RoboDK is $2995 and it includes 3D printing. 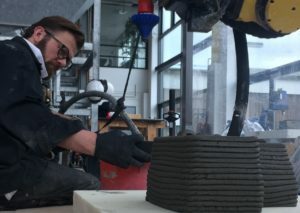 Looks amazing.. concrete 3d printing can solve many problems. You have provide such a great information regarding it. It will also add to the environmental benefits since the construction with CC technology needs fewer materials and the wastage, if any, can be recycled.